How many more copycats are waiting in the wings for their moment of fame from a national media machine that rewards them with wall-to-wall attention and a sense of identity they crave? The aftermath of the mass shooting at Sandy Hook Elementary School was not the first time fears of “copycats” imitating horrific deeds have been invoked by advocates on either side of the gun control debate (although LaPierre’s statement might have been the first time so many metaphors have been mixed in a single go). Nearly 50 years ago, the assassination of John F. Kennedy—as well as subsequent murders of public and political figures, and other shocking acts of violence—inspired a surge in support for gun regulation, and a strong reaction by the opposition. After the Warren Commission’s investigation revealed that Lee Harvey Oswald had purchased his weapon through the mail, from an ad placed by Chicago-based Klein’s Sporting Goods in the February 1963 issue of The American Rifleman magazine (the flagship publication of the National Rifle Association), Senator Thomas Dodd of Connecticut proposed legislation that would effectively ban mail-order sales of firearms to anyone other than licensed dealers. Other bills called for placing stricter federal controls on gun sales, but Dodd’s measure on mail-order sales—reportedly backed by major gun manufacturers, who hoped it would forestall more sweeping reforms (others assert their motive was in truth anti-competitive)—emerged as one of the least controversial proposals. It was not uncontroversial, however, from the perspective of the NRA, which adamantly opposed the “Dodd Bill” and devoted its public-relations resources to rallying its 723,298 members against it (membership figure derived from “95th Annual NRA Meetings: Operations in 1965,” American Rifleman, June 1966, p. 22). Recently, while rooting around in a box of various objects collected 20 to 25 years ago to use as source material for zine collages, I turned up two back issues of The American Rifleman—the January 1966 and June 1966 issues. I haven’t attempted to do comprehensive—or even extensive—research, and my exposure to more current issues of the magazine has been occasional and casual, but one thing stands out starkly from those two numbers. Or the absence of one thing. The fiery rhetoric we’ve come to expect from Wayne LaPierre and other gun-rights advocates—bordering at times on paranoia or worse—is absent. To be sure, in the Rifleman’s 1966 incarnation, the NRA firmly and consistently expresses its opposition to most (but not all) gun control measures (for instance, the NRA supported legislation prohibiting shipment of firearms to any person in violation of any state statute—statutes of which the NRA seemed to at least tacitly approve; see American Rifleman, January 1966, p. 15). But the magazine devoted just a few pages in each issue to legislative or legal matters (not counting two one-page summaries of recent court decisions in personal injury cases), focusing instead on hunting techniques, a description of the Olympic biathlon event, equipment and accessories reviews, a discourse on the training of Soviet pistol shooters, a treatment of snipers in Vietnam, a three-page description of small arms and tactics used by the South Korean Army, and other material of interest to firearms enthusiasts. A breakdown of the organization’s activities in 1965 did not specifically mention lobbying—perhaps the concept was still too immature to mention, or even to budget for—and described its advocacy efforts only in terms of providing information to members. There are no dire warnings about Washington politicians coming to take your guns away—complaints about proposed laws are worded more in terms of unwarranted inconvenience than calamitous injustice—and I only found a couple of plainly worded statements that the NRA considered the Second Amendment to provide for the individual right to bear firearms, rather than a collective right. The organization appears to take it for granted that some state and federal regulation is warranted, and the January and June 1966 issues of Rifleman make the familiar argument in more than one place that, rather than enacting new laws and regulations, the government should enforce those that already exist—in a manner that will allow the law-abiding American citizen to enjoy firearms ownership, while keeping guns out of the hands of “undesirables.” Nowhere, however, does the NRA describe what acceptable enforcement efforts would look like. The argument seems to go, Enforce existing laws—but don’t do anything restrictive … like using law enforcement resources to interfere with the right to bear arms. Or maybe more to the point, don’t interfere with commerce in arms. Leafing through those two Rifleman numbers from 1966—particularly the back pages—I got an inkling of at least one reason why the magazine so staunchly opposed federal bans on mail-order gun sales to individuals. In each issue, I counted at least 10 display advertisements of varying sizes (including the full inside back cover of each issue, with bright splashes of red ink) for fully assembled firearms (shotguns, rifles, carbines, and/or handguns). 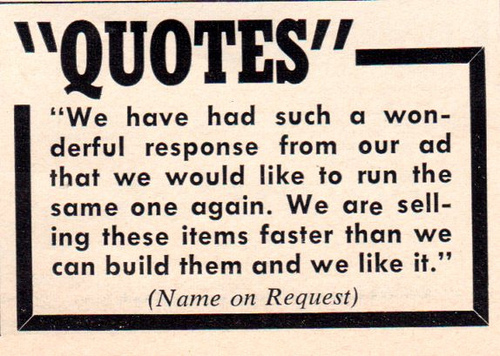 That wasn’t counting the numerous ads for parts, ammunition, and antique weapons, and I didn’t even try to read the mice-type of the many classified ads. And—if this nugget of self-promotion is to be believed—advertising in the Rifleman was effective. But let’s return to the subject of Oswald’s gun source for a moment—Klein’s Sporting Goods, of 227 W. Washington St., Chicago, Illinois. 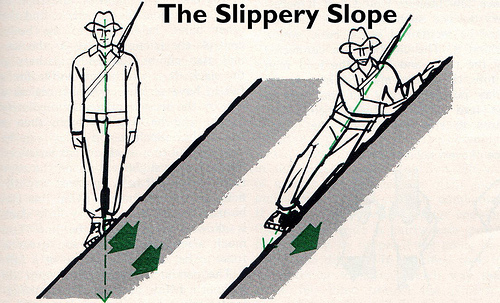 He wasn’t so nervous, however, that he stopped buying ads in The American Rifleman. Both the January and June 1966 issues of the magazine contain 1/3-page ads for Klein’s, touting shotguns, carbines, and rifles for sale by mail-order. The NRA Executive Committee, meeting in Washington, D. C., on December 4-5, 1965, reaffirmed its unqualified opposition to the provisions of S. 1592, the ‘Dodd Bill’ in the U. S. Senate. Even with proposed amendments, S. 1592 would prohibit the interstate movement of all firearms to all persons other than federally licensed manufacturers and dealers. While reiterating its opposition to this legislation, the Executive Committee took cognizance of the fact that a problem does exist where juveniles, convicted felons, and undesirables have been able to circumvent the laws of their state by purchasing firearms by the mail-order route. The Executive Committee also recognized that a problem has been created by the marketing of items of military ordnance, such as mortars, bazookas, bombs, mines, etc. The general public expects all gun transactions to be conducted with such proper precautions as to deter undesirable persons from obtaining firearms. Accordingly, gun advertisers of THE RIFLEMAN are required by NRA to obtain from all mail order purchasers evidence of a Federal Firearms License, or a ‘signed statement’ (quoted below) from individual purchasers, before shipping any cartridge firearm (rifle, shotgun, or handgun). 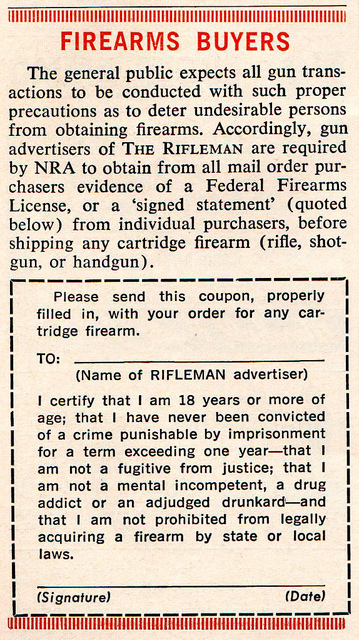 Please send this coupon, properly filled in, with your order for any cartridge firearm. I certify that I am 18 years or more of age; that I have never been convicted of a crime punishable by imprisonment for a term exceeding one year–that I am not a fugitive from justice; that I am not a mental incompetent, a drug addict or an adjudged drunkard–and that I am not prohibited from legally acquiring a firearm by state or local laws. What else could you want? It asks for signature and date. Heavy factual responsibilities. Oswald didn’t use his real name when he mail-ordered his Mannlicher-Carcano rifle for $21.45 by postal money order. History doesn’t record whether he provided a date for anything, or if so, what date it was. But if he had been an “adjudged drunkard,” I’m sure he would have been too abashed to go through with the transaction. The Act “provided no authorization for an oversight mechanism to insure that licensed dealers did not transfer firearms to [high-risk] persons. … The preamble to the GCA defined its purpose as providing support to state efforts at firearm regulation without placing a burden on legitimate firearm users. These themes dominated the entire law.” Vizzard, W., “The Gun Control Act of 1968,” St. Louis University Public Law Review, vol. 18, no. 1, 1999. More comprehensive legislation had failed in Congress. And rather than proving to be an incremental step, the 1968 Act appeared to be the “end of an era,” with government emphasis in the 1970s shifting “toward implementation of existing law, while interest groups, on both sides, solidified and intensified their positions.” Id. In those days, I think that the word undesired was code for communists. The Cold War, now those were the days. I am sure “commie” was assumed to be within the set of “undesirables,” along with a few other types of fellow travelers. “Jane Fonda,” and so forth. I was somewhat surprised, though, by the lack of hippie-punching in the magazines. It read as primarily a hobbyist journal — tips, techniques, gear reviews, etc. Even the article about Soviet competition pistol shooters was dry and factual, without any of the fun stuff about robotic godless slaves who will be sent to the gulag as soon as they fail Mother Russia by coming in second place, etc. I think you have to go to “American Legion” magazine for that kind of Quality Fascist Lit.